Our care is FREE even if you don’t have OHIP. You don't need a doctor's referral, just complete our online form or give us a call. Our care is personalized to your unique needs and situation. You will have a midwife that you know and trust attend your birth. Enjoy postpartum visits in the comfort and convenience of your home. 24/7 paging for urgent concerns. Chose to deliver in the setting where you are most comfortable (home or hospital). You will have access to higher risk care if complications arise. It's never too early to call or click (once you are pregnant). We can often accommodate women later in their pregnancies, so it’s never too late to call either. We support the choice of planned home birth as an option for healthy mothers. There is a lot of research that supports the safety of home birth. Women who birth at home benefit from increased convenience, privacy and feelings of being in control. Midwives provide complete prenatal, labour, birth and postnatal care to healthy women and their babies. Midwifery care is free for all residents of Ontario. You don't need to be a Canadian citizen and you don't even need a health card (OHIP). The Hamilton Midwives deliver babies at St Joseph's Hospital. We provide complete care for mothers who choose to have a hospital birth. Our clients have access to the care and expertise of the wider medical team if complications arise. 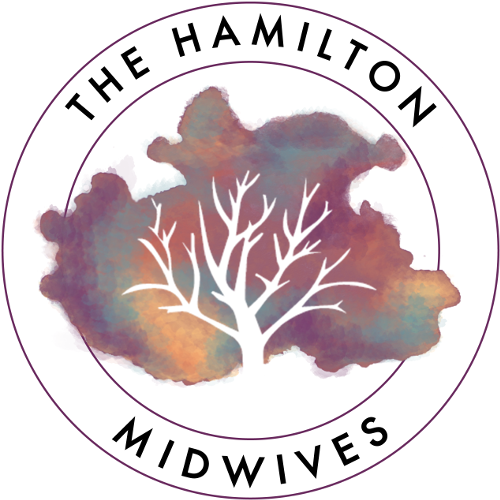 The Hamilton Midwives serve Ancaster, Dundas, Stoney Creek, Waterdown, East Hamilton, Hamilton Mountain, Winona, Flamborough, Caledonia, Mount Hope and surrounding areas. Request a midwife today. Midwives qualify for registration by graduating from the Ontario Midwifery Education Program, a four year university degree program. Foreign-trained midwives complete the International Midwifery Pre-registration Program at Ryerson University. Meet our midwives.